Toilet Brush and Bucket "We created this combination as it was impossible to find an attractive and functional toilet set. We like the functional look of the traditional florist's Bucket and traditional wooden brush." Photo courtesy of Labour and Wait. Enamel Soap Dish "We love the simplicity of this item. A real classic and very practical with the separate drip tray." Photo courtesy of Labour and Wait. Folio Bag "An archive design selected from the manufacturer's archive. We love the traditional craftsmanship, combined with a contemporary look. Very useful for carrying a laptop." Photo courtesy of Labour and Wait. Large Brown Satchel "A real classic. We like the nostalgic appeal of this satchel." Photo courtesy of Labour and Wait. Sori Yanagi Kettle "We fell in love with this kettle when visiting Japan. Designed in the 1990's, this kettle has an incredible understated elegance and a timeless look." Photo courtesy of Labour and Wait. Giant Dustpan "One of our all time favorites. We first saw this product in the United States. We were instantly drawn to its practical and simple styling." Photo courtesy of Labour and Wait. "Duralex" Tumbler "A design icon. Great to hold and infused with memories of school and drinking wine on French holidays!" Photo courtesy of Labour and Wait. Can Opener "Simply the best can opener we have ever used. So simple and affordable. It does the job better than any other." Photo courtesy of Labour and Wait. Enamel Lampshade "Specially made for Labour and Wait, this lampshade is based on the original vintage examples hanging in our store." Photo courtesy of Labour and Wait. Brown Canvas Apron "We produce this apron. Made of a very functional heavy duty canvas, this apron has now been adopted by several restaurants and stores." Photo courtesy of Labour and Wait. Wooden Door Mat "A great heavy-duty solution for muddy boots." Photo courtesy of Labour and Wait. Enamel Milkpan "We are very fond of all our enamel cookware. Great quality and great design from a historic company." Photo courtesy of Labour and Wait. When fashion design lost its luster and took the form of fleeting, regurgitative styles and overconsumption, British menswear veterans Rachel Wythe-Moran and Simon Watkins traded trends for timelessness by opening Labour and Wait. In their East London shop, the business partners offer goods for the home, kitchen, and garden, each designed to last a lifetime. 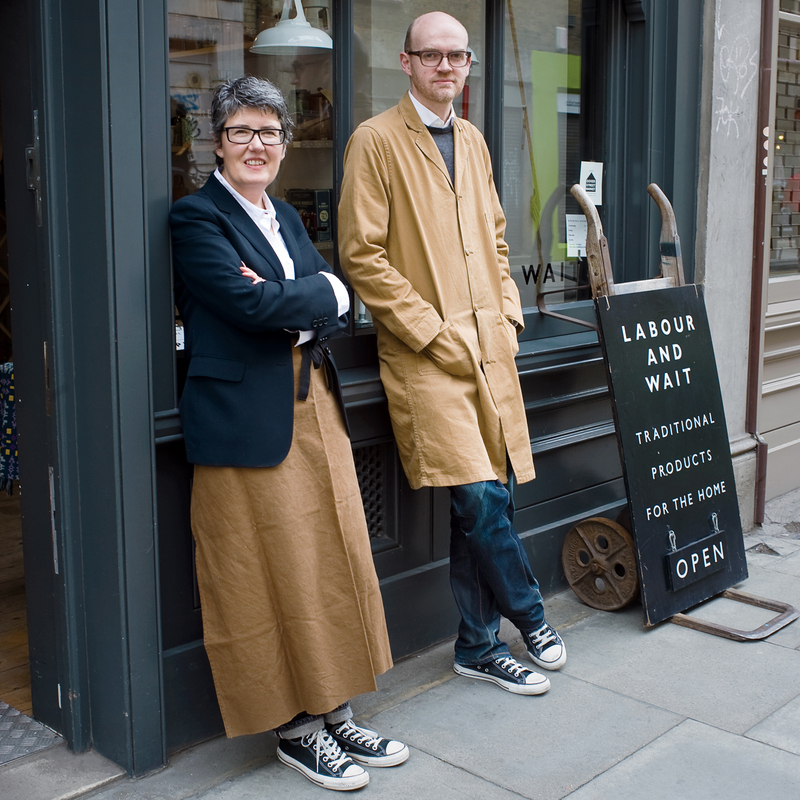 “We sell everyday classics,” Watkins says, “products that almost don’t look as though they’ve been designed at all but have just evolved into the most practical form they could take.” Now, ten years since they sowed the first seed for their store, Wythe-Moran and Watkins have accumulated a substantial stock of wares that will never go out of fashion. Simon Watkins: We both have to like it; that’s number one. Rachel Wythe-Moran: And it has to have a function; we don’t sell anything that’s just for decoration. RWM: A brown bread bin made especially for us by our enamel manufacturer in Austria. What are you currently longing for? SW: We’re always being asked for wooden ironing boards, but we just can’t find anyone who makes them for a reasonable price. What are your favorite items to sell? SW: The aluminum dustpans. They look great, work really well, and are substantial. We had a customer buy one and then come back needing a new one, because he had had work done and the builder loved it so much he took it! RWM: I spent hours trying to find a nice wooden toilet brush and a container to put it in. We finally found a set, and it sells incredibly well. Customers also used to inquire about our enamel pendant lamps so we developed them into a product. Has the store influenced your personal tastes? SW: The store has always been within us. Lots of things we sell are things we’ve had ourselves for years but couldn’t replace and now are trying to find the people who make them. Why is East London a good place for a design store? RWM: We wanted to be somewhere near a weekend market. Now, the area is becoming much more popular. There are a lot of buildings going up and the train is being extended here. In some ways we’re sad because we were off the beaten track and people had to make a journey to get here, but from a commercial angle, it’s good. SW: The shop next door is called Mar Mar Co. and specializes in Scandinavian-inspired design. Nearby are a jewelry designer, T-shirt shop, and vintage-clothing store. What’s next for Labour and Wait? SW: Hopefully a bigger shop—–we’re bursting at the seams. RWM: And we’d still like to add a bookshop, tea shop, and haberdashery and laundry supply area.